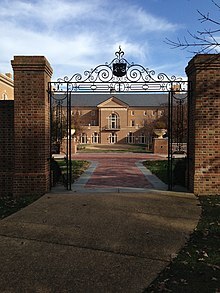 The Raymond A. Mason School of Business is the business school at the College of William & Mary in Virginia. The school, named after alumnus and founder of Legg Mason, Raymond A. "Chip" Mason, in 2005, was ranked in the top 20 MBA programs in 2007 and the top 10 undergraduate programs among public universities. The school offers Full-time MBA, Part-time MBA, Executive MBA, Masters in Accounting, Master of Science in Business Analytics and Undergraduate Business Degrees. In 1919, William & Mary President Julian A.C. Chandler established the Department of Business while expanding the College's sphere of services. The study of business grew in popularity over the 20th Century, with substantial growth after the end of World War II. The College established the Master of Business Administration (MBA) Program in 1966. In 1968 the Department of Business became the School of Business, and in 1971, the College's Board of Visitors approved the addition of the Bachelor of Business Administration (BBA) undergraduate degree. One in six undergraduate students at the College major or minor in business, making it the most popular major on campus. The Mason School of Business is an AACSB-accredited school of business. Students are immersed in real business situations throughout the undergraduate and graduate business education programs. Each year, accounting masters take a 5-day field trip to meet with professionals in the field. The full-time MBA program, a 21-month program offering instruction in entrepreneurship, finance, general management, marketing, information technology and operations management. The program hosts a distinguished speaker series, organizes visits to various corporations, and facilitates internal and external case competitions, as well as cultural festivities, philanthropy and sustainability initiatives. The Raymond A. Mason School of Business ranked #57 in the 2017 edition of the U.S. News rankings. In the same year, Mason's MBA program was ranked #58 by Forbes, #55 by Poets & Quants, #54 by StartClass, and #42 nationally by Bloomberg Businessweek. Mason's part-time MBA program was also ranked #16 by U.S. News. The Flex MBA, established in 1985, is located at the Peninsula Center in the Oyster Point area of Newport News; the Executive MBA program, established in 1986, is a 20-month program for executives with classes on every two weeks on Friday and Saturday. The Master's in Accounting program (MAcc), is a one-year program that provides the necessary credit hours and curricular requirements to be eligible to sit for the CPA exam. As of mid-2015, the program ranked #20 nationally according to LinkedIn. The site bases its rankings on recent graduate's success in landing desirable accounting jobs. The MS in Business Analytics is a new 1-year, accelerated program. The Bachelor's in Business Administration program (BBA) is a two-year program within William & Mary that provides undergraduate business education in five majors: Accounting, Finance, Marketing, and Business Analytics. Students who major in Business are also eligible to concentrate (mini-major) in any of the major fields, plus Entrepreneurship and Consulting. It additionally provides minors in the above-mentioned majors and Management. According to 2016 rankings, William & Mary's undergraduate program was ranked #12 by Bloomberg. Niche ranked the undergraduate program #26 nationally in 2017 while U.S. News ranked Mason #42. 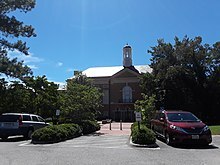 The business school is housed on the main campus of William and Mary in Williamsburg. The Mason School of Business moved into its new building, Alan B. Miller Hall, in fall 2009. Miller Hall was named for William & Mary alumnus, Alan B. Miller, whose accomplishments are described below. It is located at the Corner of Ukrop Way and Jamestown Road at the western edge of campus. The building was designed by Robert A.M. Stern Architects in the Georgian style. The Executive Partner Program consists of active, semi-retired and retired business executives that will be students' career coaches and advisors, inside and outside classroom. ^ "The College of William and Mary School of Business Now the Mason School of Business". College of William & Mary. November 11, 2005. Retrieved 2007-05-28. ^ "Which MBA Online". Economist Magazine. 2007. Retrieved 2007-05-28. ^ a b c d "Business School Overview". USNews.com. Retrieved 11 April 2012. ^ "Mason School of Business, College of William & Mary". TopMBA. Retrieved 11 April 2012. ^ "Best Graduate universities for Accounting Professionals". LinkedIn. Retrieved 16 May 2015. ^ "Robert A.M. Stern Architects, LLP". www.ramsa.com. Retrieved 2017-02-02. ^ a b c "William & Mary Alumni → Notable Alumni". The College of William & Mary Alumni Association. 2008. Archived from the original on January 31, 2009. Retrieved July 5, 2009. ^ Wangrycht, Gina M. (Spring–Summer 2004). "King of a Virtual Fantasy World: Todd Howard '93". William & Mary Alumni Magazine. 69 (3/4). Archived from the original on October 3, 2011. Retrieved July 10, 2009. ^ Grigsby, Hugh Blair; Brock, Robert Alonzo (1891). The History of the Virginia Federal Convention of 1788. The Society. Retrieved July 10, 2009. ^ Patrick Mcgeehan (December 17, 2000). "Private Sector–A Wall St. Son at Nasdaq's Table". The New York Times. Retrieved July 15, 2010. ^ "Paul C. Saville, CEO Compensation". Forbes.com. Retrieved July 10, 2009. ^ "Walter J. Zable, CEO Cubic". Forbes.com.